Investigating the biology and management of insect pests in canola, wheat, and forage seed crops grown in the Peace River region. Blog is an unofficial place to post personal observations and updates. Centennial and Canada 150 Events in 2017! Slide deck from presentation delivered February 6, 2019, to Oregon Clover Growers. Insect pest Q & A describing the biology and damage initially reported in the Peace River region (2007). Preliminary research poster (2006) - "Clover insect pests - European flare for damage?" Red clover casebearer lifecycle in the Peace River region (Otani 2006). Prairie Pest Monitoring Network's "Insect of the Week" featuring the red clover casebearer and link to the Field Guide pages. IPM Lab Blog student write-up describing 2016 field activities. Alberta Forage Manual (2009; Ag-Dex120/20-1; ISBN 0-7732-6082-X; pdf version). Includes Forage Insects and Natural Enemies of Forage Pest Insects chapters. Arthropods of legume forage crops (2011; ISBN 978-0-9689321-5-5; pdf version). Field crop and forage insect pests and natural enemies in western Canada (ISBN 978-1-100-25768-6; pdf version). Cutworm field guide (2017; ISBN 978-0-660-08051-2; pdf version). 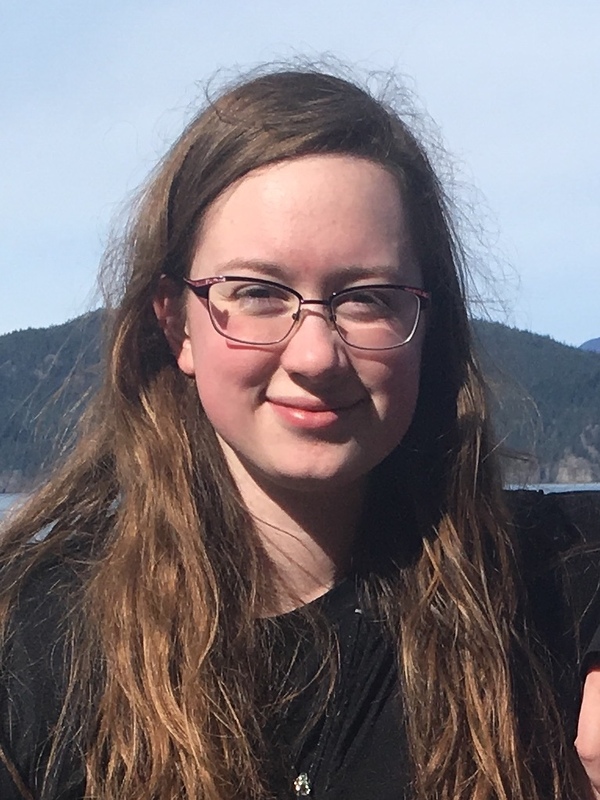 Meet our students (2019) - Introducing Stephanie! Hi! My name is Stephanie Thompson and I recently started working with the Beaverlodge Research Farm in the Integrated Pest Management program. I am from Winnipeg, Manitoba, and in my third year of undergraduate studies at the University of Manitoba majoring in Biological Sciences. My goals for this work term are to learn more about the program and gain skills and experience doing laboratory-based research. I also hope to become more knowledgeable regarding the various types of arthropods that are both pests and beneficials in the agricultural ecosystem on the Canadian prairies. So far, I have been assisting a M.Sc. student, Shelby Dufton, with processing pitfall samples collected through the summer of 2018. Everyone I have worked with thus far has been great and I look forward to spending the next 4 months learning with and from them. Pheromone trapping for the 2018 growing season is now completed with cumulative counts revealing moths at five of the six sites AAFC-Beaverlodge monitored (Fig. 1). The site near Fairview had the highest moth counts but the total number of intercepted moths still sits within the "low risk" category used by Alberta Agriculture and Forestry to help predict bertha armyworm larvae during the early pod stages. Figure 1. Cumulative pheromone trap counts (n=1 trap per site) from commercial fields of canola grown in the Peace River region in 2018. This preliminary data is not to be copied or reproduced without permission. Growers are encouraged to use the above information to prioritize their in-field scouting. The above pheromone traps are not precise predictors but remain valuable to growers because they help identify WHERE the moths were flying and WHICH FIELDS TO CHECK for larvae (Fig. 2). Figure 2. Late instar bertha aryworm larvae (photo credit: AAFC-Saskatoon). 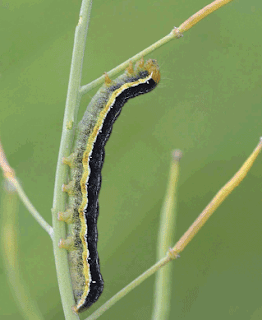 When present, bertha armyworm larvae should now be moving upwards on canola plants to feed on the developing pods. The economic threshold for bertha armyworm applies to the larval stages so use the tables posted here to help guide your in-field pest management. Low numbers of bertha armyworm can fall within a tolerable level where negligible feeding damage may occur but no economic losses will result! Scout and use the economic threshold values to avoid economic losses! Reserve insecticide use only to manage outbreaking populations of bertha armyworm! Not spraying actually protects and preserves the many natural enemies already actively working for free in fields! Learn more about bertha armyworm, @FieldHeroes, natural enemies, and use the canola scouting chart to help your canola produce this year! Contact Jennifer Otani for more information and thank you to our producer-cooperators! 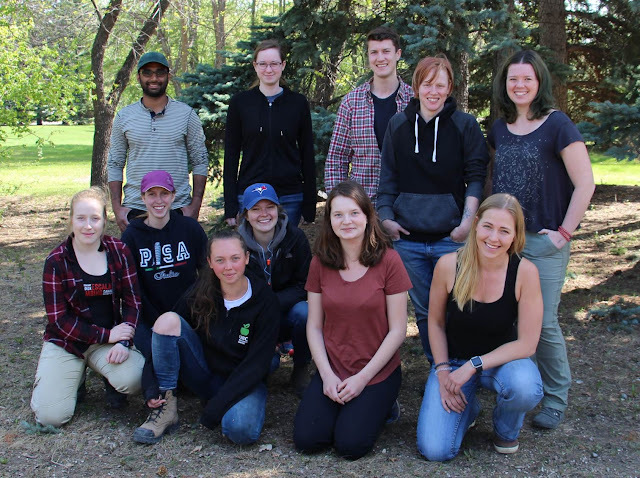 Students are an important part of our research, especially during the summer months when field and laboratory work peaks at the Beaverlodge Research Farm. Each summer, student assistants are hired using FSWEP1, COOP2, and RAP3 programs. These job positions offer a unique opportunity for students to learn valuable on-the-job skills while supplementing the applied side of their scientific education. The federal hiring programs used to staff our student assistant positions require that students be enrolled at a recognized post-secondary institution and that students carry a full-time course load both prior to and following their period of employment. In fact, our research programs typically screen applicants by the end of December in order to offer positions to work at our Farm from May-August. Back row (L to R): Nabeel Abdul-Basith2Φ enrolled at Mount Royal University, Maya Schmidt3π enrolled at the University of Alberta, Michael Theriault2Φ enrolled at Mount Royal University, Amanda Jorgensen3π enrolled at the University of Alberta, and Shelby Dufton3π enrolled at the University of Lethbridge. Front row (L to R): Marie McCallum2Ψ enrolled at the University of British Columbia, Jacey Toerper3Ψ enrolled at the Grande Prairie Regional College campus of the University of Alberta, Megan McElhinny2Ψ enrolled at the University of British Columbia, Haley Brackenridge2Ψ enrolled at Queens University, Rebecca Philip2π enrolled at Thompson River University, and Julia Kappeler3π enrolled at the Augustana Campus of the University of Alberta. Absent from photo: Jeremy Poortvliet2Φ enrolled at University of the Fraser Valley. Meet our students (2018) - Introducing Rebecca! Hello! My name is Rebecca Philip and I have been working at AAFC-Beaverlodge since September 2017. From September to the end of December 2017, I was working in the Pulse Breeding program based out of AAFC-Lacombe where I was responsible for carrying out cross pollination of pea flowers in an effort to develop new varieties of field peas. I am excited to switch to the Insect Pest Management program and to learn about insect pests and some of the natural enemies found within field crops grown in the Peace River region. I am currently enrolled in the third year of the Natural Resource Science program at Thompson Rivers University, which is located in Kamloops BC. I have a strong love for the outdoors and working outside and I am lucky to have a job and a program that reflect this! Although I come from BC, this is not my first time living in Alberta. Most of my childhood was spent just north of Edmonton in the small town of Bon Accord. So far, the first weeks in the IPM program have been focused on data entry for the 2017 CARP Flea Beetle project but I’ve also been processing wheat midge from samples collected during the growing season. We are retrieving wheat midge larvae from wheat heads threshed using a single-head thresher. The data will quantify the density of wheat midge occurring in local wheat fields. In the near future, I will work on the Prairie Pest Monitoring Network’s Blog to archive and update information in preparation for the 2018 growing season. Figure 1. 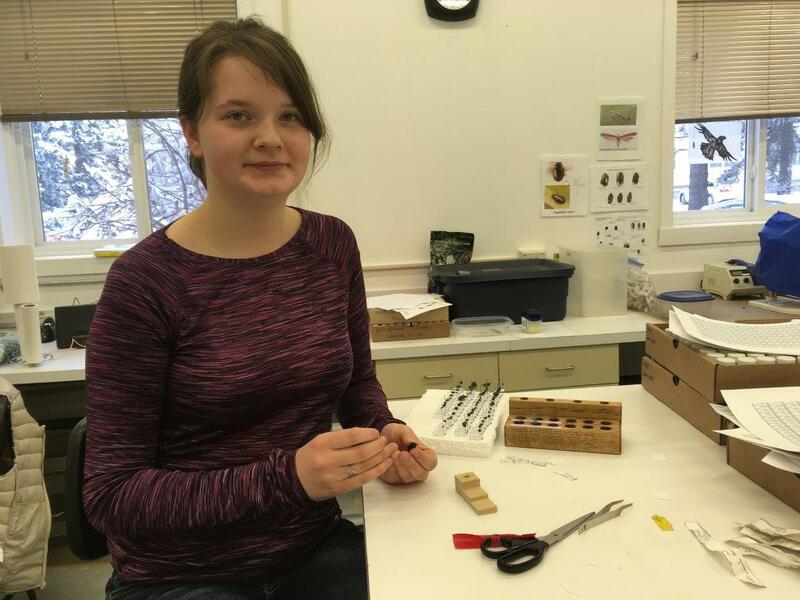 Rebecca pinning and labelling carabid beetles. Meet our students (2018) - Introducing Maya! My name is Maya Schmidt and I’ve just begun my second summer working at the Beaverlodge Research Farm.It’s my first time working with the IPM program. I’ve recently finished my first year of my Bachelor of Engineering at the University of Alberta. I am eager to learn tons this summer and have already had fascinating experiences in my first few weeks of the job. In the last couple of weeks, we’ve been setting up flea beetle and diamondback moth traps located at various growers’ fields around the county. The flee beetle traps are a double sided yellow sticky card – the yellow colour of the card is what attracts the flea beetles. The diamondback moth ones are set up as a delta trap, with a sticky card and pheromone lure inside to attract male moths. Recently, we collected the first set of cards which need to be collected and replaced every week. The cards are processed by inspecting them under a microscope. We identify and count the target insects on each trap. The other new students and I have also been assisting the two graduate students, Amanda and Shelby, with processing their wheat samples. Their experiments involve hand-threshing wheat head samples to identify and count wheat midge larvae infestation levels. Other collecting and processing involved red clover field trash where we are looking for overwintered weevils and red clover casebearers. I hope to gain valuable experience, expand my scientific knowledge and perhaps step out of my comfort zone. It looks like it’s going to be an interesting summer! Meet our students (2018) - Introducing Julia! Hi! My name is Julia Kappeler. I worked for Agriculture and Agri-Food Canada in Lacombe last year, but relocated to Beaverlodge this summer to gain experience. I am excited to be involved with the Insect Pest Management program and have a lot to learn here. I am a fourth-year student at the University of Alberta’s Augustana Campus in Camrose, majoring in Biology. I’ve been involved with undergraduate entomology research at Augustana with Dr. Tomislav Terzin. 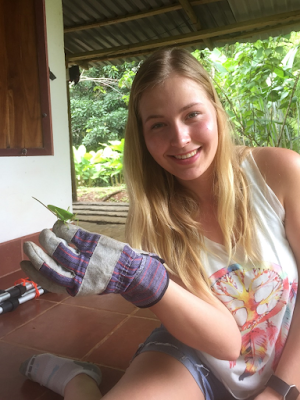 This past January, I took part in a field study course in Costa Rica where I studied katydids as bioindicators. I am an aspiring entomologist and bug collector and am excited to see what this season here in Beaverlodge and the Peace River region brings!